2 fishermen killed as boat capsizes in Bay of Bengal. Did they carry explosives? Police of this port town are investigating the foul play angle to the death of two fishermen when their boat was upended in the Bay of Bengal. 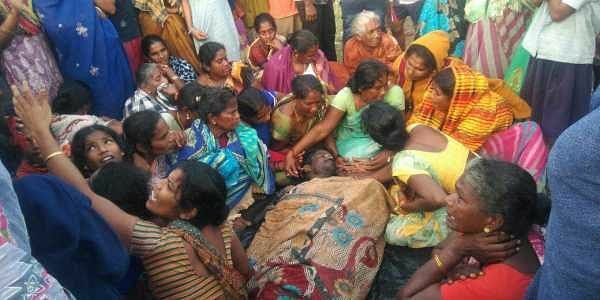 VISAKHAPATNAM: Police of this port town are investigating the foul play angle to the death of two fishermen when their boat was upended in the Bay of Bengal during the early hours of Thursday. Two fishermen died and one sustained severe injuries when their boat capsized in high waters off Visakhapatnam. The incident happened barely 2 km out. Fishermen Milapalli Satteyya (50), Ummidi Somesh (37) and M Tatarao (33) received severe injuries as they were thrown into the fan blades of the engine. They were in a group of 15 fishermen from Bangarammapalem who set out at around 4.30 am on Thursday. The other fishermen in the group rescued the injured men and rushed them to the Nakkapalle primary health centre. But doctors declared Milapalli Satteyya and Ummidi Somesh brought dead. The condition of M Tatarao too deteriorated and he was shifted to the King Geroge Hospital (KGH) in Visakhapatnam where his condition is critical. Police have registered a case of suspicious death. "Though eyewitnesses told us that the boat capsized due to the strong waves, we have doubts after examining the serious injuries on the bodies of the victims," sub-inspector Kumaraswamy told New Indian Express. According to sources, police are suspecting foul play as fishermen from this region are in the habit of carrying low-yield explosives to kill large marine mammals.